16:13:15, 31/08/2018 Hanoi (VNS/VNA) - Heavy downpours and floods in northern mountainous and Cuu Long (Mekong) Delta provinces over the past days have wreaked havoc. Hanoi (VNS/VNA) - Heavy downpours and floods in northern mountainous and Cuu Long (Mekong) Delta provinces over the past days have wreaked havoc. As rain is forecast to continue in the coming days, flash floods and landslides are predicted, according to the National Centre for Hydro-Meteorological Forecasting. According to reports from northern provinces of Bac Kan, Hoa Binh, Dien Bien, Son La, Thai Nguyen, central province of Thanh Hoa and Mekong Delta province of Long An, as of August 30 morning, downpour and floods made 124 houses collapse and inundated 174ha of paddy fields. Nearly 5,000cu.m of rocks and soil have eroded. Falling rocks killed a two-year-old girl in Hoa Binh province’s Mai Chau district, while one person went missing and three others were injured. Dien Bien province, one of the hardest hit, had 700 landslide spots. Three communes’ headquarters have been flooded by half a metre of mud. Total losses in the province have so far reached 120 billion VND (5.2 million USD). The Directorate of Water Resources has warned that water levels in Mekong Delta localities might exceed level 3, the highest warning level. Floods are predicted to affect 165,200ha of autumn-winter rice crops in provinces located in the upstream of the river such as Dong Thap, Kien Giang, An Giang and Long An. 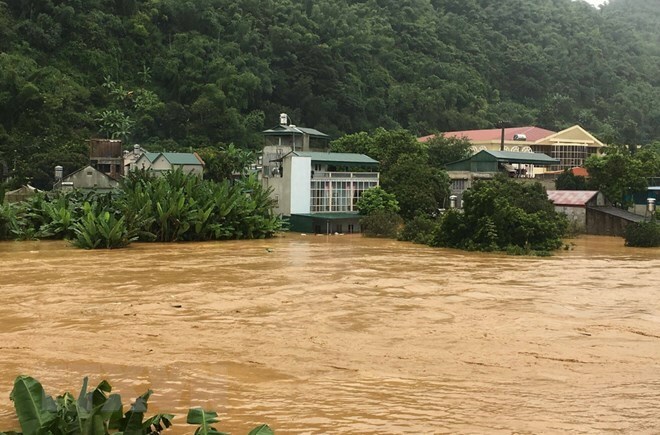 Six mountainous districts in central Nghe An province – Ky Son, Tuong Duong, Con Cuong, Que Phong, Quy Chau and Quy Hop - are at risk of landslides and flashfloods, according to the centre. As of August 30 morning, eroded roads connecting communes in the province had not been repaired. Cracks on National Highway No 7 caused by heavy rains between August 16 and 23 have not been repaired and are predicted to encroach upon a larger area. The National Steering Committee on Natural Disaster Prevention has ordered safety measures to be taken in the Mekong Delta provinces of An Giang and Kien Giang to protect structures located by the rivers and dykes, as the Tra Su and Tha La dams release water on August 31. Localities in northern mountainous areas must mobilise forces to address the consequences of floods, especially recovering 12 landslide spots in Dien Bien province and eight others in Son La province. Prime Minister Nguyen Xuan Phuc has ordered mobilising equipment for northern Lai Chau province to respond to natural disasters including 506 tents, nine power generators and six boats. Why does the UN focus on climate-related security risks?